Daniel Gingrich gave a rousing performance of Mozart's Horn Concerto No. 3, conducted by Edo de Waart. Sometimes it’s nice to bring it back to basics. 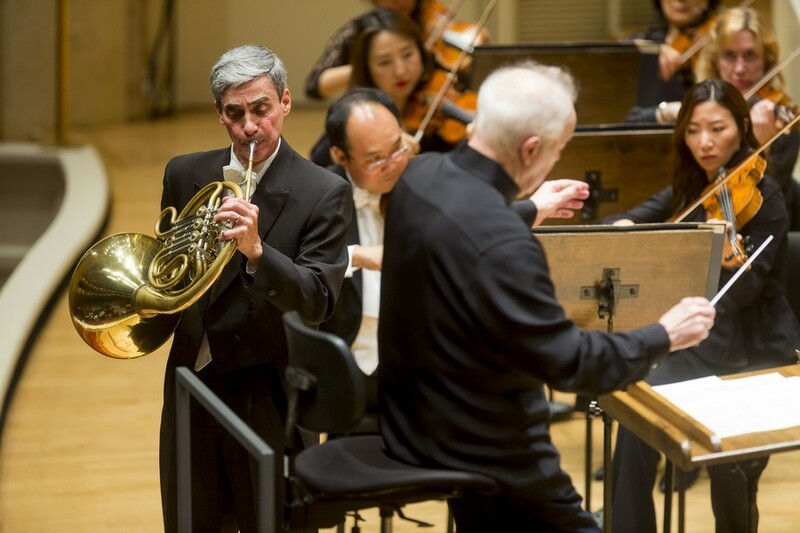 On Saturday evening, the Chicago Symphony Orchestra (CSO) veered off the contemporary music trail in a program of Mozart’s Prague Symphony and Third Horn Concerto and Beethoven’s Symphony No. 2. On the podium was Dutch maestro Edo de Waart, who stepped in for Christoph von Dohnányi as the latter recovers from an eye injury. There is a reason Mozart and Beethoven are cited as some of the greatest composers of all time—whenever I hear their work performed live I am reminded of their genius. There is something oddly refreshing about hearing an “old-school” concert, and Saturday’s audience seemed to agree. Even with a bumpy start, Prague ended on a high note. De Waart took the dramatic opening a little too slow for my taste, and the woodwind section struggled with intonation and cohesion with the strings. It was not until the ensemble arrived at the main theme of the movement that I felt a “click,” albeit a slightly tired one. The middle Andante was an improvement from the first movement, but when the orchestra reached the Presto of the final movement, the players demonstrated their best musicianship. The strings finally embodied the silky tone that best suits the tenderness of Mozart, and everyone, players and audience alike, seemed more energetic. I was glad that the orchestra was able to use the Mozart symphony to work out its difficulties, because acting principal horn player Daniel Gingrich’s performance of Mozart’s Horn Concerto No. 3 in E-flat Major did not deserve to be overshadowed by any shortcomings from the ensemble. Gingrich’s tone was pure and well-rounded. Throughout, soloist and orchestra supported each other, communicated well, and were stylistically one. Gingrich, who has been sitting principal horn as the CSO searches for someone to replace Dale Clevenger, particularly shone in the third movement, which features hunting music melodies that are extremely well suited to horn. Once again, like the Prague, the orchestra hit its stride most prominently in this final movement, though in a way that was far less noticeable than in the first piece. Ultimately, de Waart elicited a nice polish from the orchestra, even if the openings of both Mozart works were somewhat wanting in clarity and cohesion. This was yet again the case in the Beethoven, which was neither heavy-handed nor timid. While certainly a solid performance of the energetic Second Symphony, some movement away from this middle ground might have given the sleepy ensemble some of the energy it needed to really bring out the dynamic nuances of the score. That being said, the orchestra really did play quite well—the performance was true to the score, and the orchestra played with a nice control. Even with the ensemble not necessarily giving its all, the performance was dependable, and Beethoven is an automatic crowd-pleaser. Though Saturday evening was not interpretively earth-shattering, it was still highly enjoyable. Sure, more dynamic contrast would have made these old classics feel new again. But ultimately, classics are classics because they stand the test of time. If the audience’s reaction at the end of the evening is any indication, it seems that Beethoven and Mozart are doing just fine. I’m glad the CSO disembarked from the premiere train for just one night—sometimes it’s nice to stop and smell the roses.